Datacentre and colocation service provider Digital Realty Trust has opened a €150m datacentre in Dublin as part of its plans to develop 15.36MW of datacentre space across four buildings, totalling 85,000ft2, in the region. The facility, based in Digital Profile Park, west of Dublin, features an indirect air-optimisation system, which improves clients’ datacentre energy efficiency by reducing power usage effectiveness (PUE) and, therefore, their total cost of occupancy, said Bernard Geoghegan, managing director for Europe and Asia-Pacific at Digital Realty. PUE allows datacentres to measure their energy efficiency. It is determined by dividing the amount of power entering a datacentre by the power used to run the computer infrastructure inside it. During the testing phase at peak load, the Dublin datacentre facility achieved a PUE of between 1.15 and 1.18. By comparison, the PUE utilising a traditional chilled-water system is approximately 1.6. Facebook, which runs four energy-efficient datacentres around the world, has a PUE of 1.09. The Digital Realty datacentre is designed to offer both local and multinational enterprise clients a range of connectivity options into the wider Digital Realty ecosystem, said Geoghegan. The facility has also received a Tier III compliance certification from global datacentre authority the Uptime Institute. There are four Uptime Tiers – Tier I is the simplest and least highly available, while Tier IV is the most complex and most available. Tier III has a redundant capacity of 99.741% uptime. The failure of any capacity component can be manually operated by switching to a redundant item with a short period of downtime, but scheduled maintenance still requires downtime. 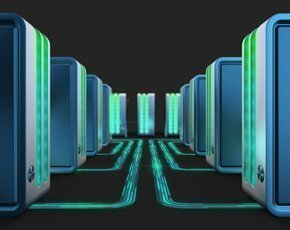 The Tier III certification will assure potential enterprise customers that all elements of the critical infrastructure of a datacentre are capable of enterprise-grade performance, said Geoghegan. The certification illustrates the datacentre’s rigorous requirements for high-availability service capabilities, according to the company. Digital Profile Park is the first and only certified datacentre in Ireland today, claimed the company, adding that the facility provides maximum product flexibility with state-of-the-art power, cooling, connectivity and system redundancy. The datacentre has also achieved Breeam (BRE Environmental Assessment Method) approval, which recognises best practice in sustainable building design. Breeam is an environmental standard that rates the sustainability of buildings in the UK. The metric was developed in 1990 by a UK group known as the Building Research Establishment (BRE). It aims to minimise environmental impact by ensuring sustainability best practices are in place while also lowering organisations' costs through energy efficiency. Digital Realty also recently signed an agreement with Canberra Data Centres (CDC), enabling the Australian Capital Territory (ACT) based datacentre provider to use Digital Realty’s Tier III-certified Sydney and Melbourne datacentres for its government panel supply contracts.